Submitted by peter on 27 August, 2007 - 09:49. 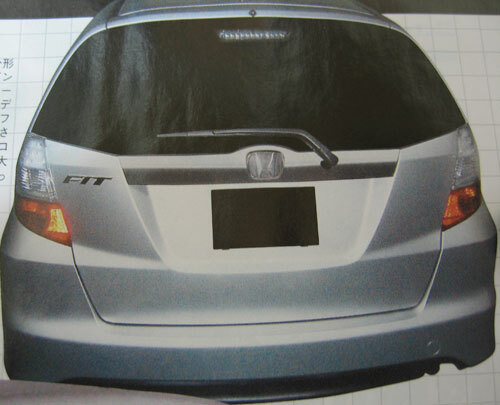 Finally we are starting to get a more solid idea of the 2008 Honda Jazz. 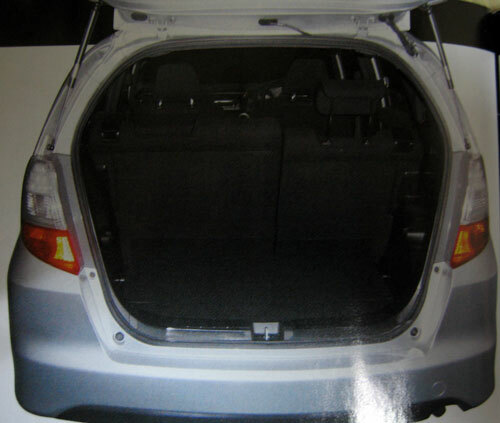 Called the Honda Fit in the Japanese market, the Jazz is a very popular car and has been a global success for the marque. The Jazz has been a hit here in Thailand, and even with the arrival of the new generation Toyota Yaris, Honda has still had little trouble selling the Jazz in impressive numbers. This is mostly down to the practical nature of the car, it offers more interior space than the Yaris, even rivalling some much larger cars in this department, and the 1.5 VTEC engine mated to the excellent CVT system make it very smooth and easy to drive. But perhaps the most distinguishing characteristic of the Jazz is the wonderful seating system. Honda have had a busy few years with new car launches. The Civic and CR-V have both been replaced in the last 2 years, and this year will see the Accord replaced with an all new model also. 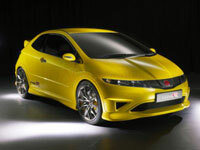 This leaves only the Jazz and City paring and it is very likely that they will be Honda's launch project for next year. Despite rumours that Honda may drop the Jazz/City in Thailand, replacing them with a much cheaper EcoCar, I would feel that Honda would be mad to drop such a successful pairing. At a glance at the (poor quality) scans from a Japanese magazine, you'd be forgiven for thinking that this was just a minor facelift. And while it is true that the exterior retains most of the major design elements from the existing Jazz, a closer scrutiny of the new model shows up some major changes. This is a brand new car! There are elements of the Euro Spec Civic Hatchback to this, including the front grille and hood, and front bumper/spoiler arrangement. The headlights remain similar to the current model, but extend much further back towards the A pillar, and look sharper as a result. From the side and rear, things don't look all that different, although they are. The car is 55 mm longer, 20 mm wider, with the wheelbase being 50 mm longer than before. 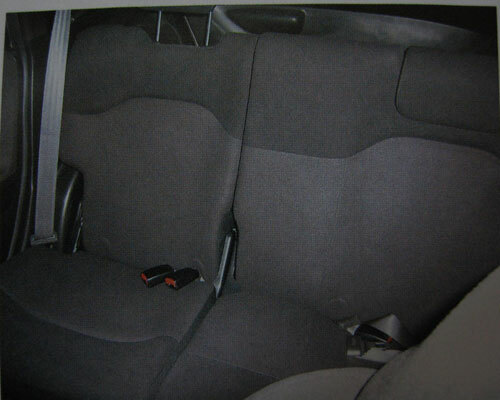 Inside the car things are completely different, again borrowing many design elements from its big brother, the Civic. 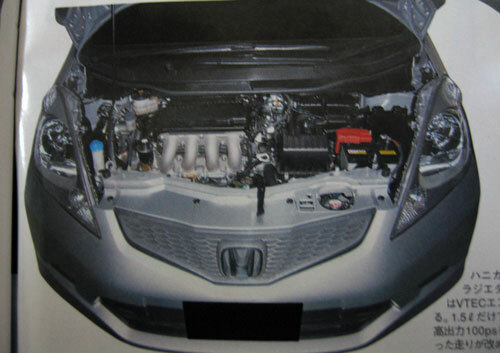 The image below is from the Civic Type R. Notice that the centre air vents and hazzard light switch. 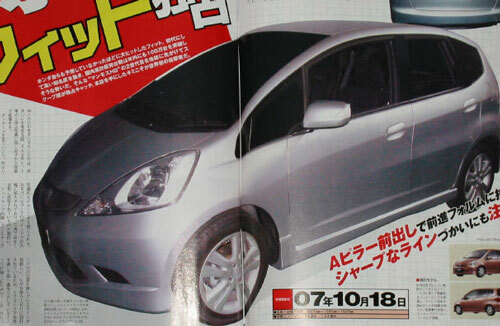 Again, these scans aren't the highest quality, but the new Jazz looks to be moving up-market a little bit. 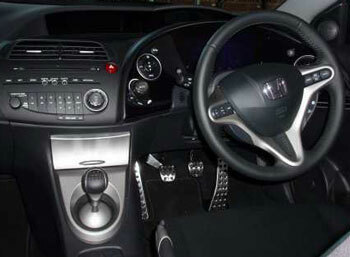 The steering wheel looks like the Civic's, with steering mounted controls available. 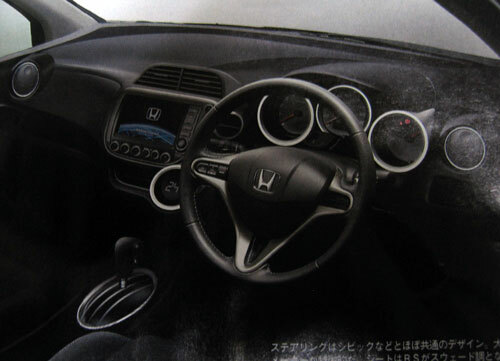 What is not clear from these pictures is if the steering wheel mounted gear selection will be kept, but it looks like the answer is no. 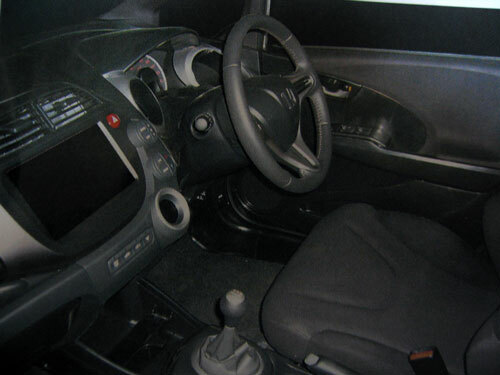 It is possible the the Jazz will go back to a conventional automatic gear box in the 2008 Jazz. The engine line up for the Japanese market will include 1.3 liter and 1.5 liter options, but here in Thailand we will probably just have the 1.5 liter as is currently the case. Power is up a little on the 1.5 VTEC from 110 hp to 120 hp. We're expecting an official press release, and official photos of the new Jazz in the next week or so. More when we have it.